Animal Pest Management Services are industry leaders in Feral Fox control throughout many different urban, industrial and rural areas. We have executed fox shooting, poisoning, culling and trapping programs in all States of Australia, with some of the highest success rates in the industry. The first successful introduction of European red foxes into Australia occurred in 1871, although foxes were reported as introduced as early as 1855. Foxes were first reported in Western Australia in 1911-12. Within 100 years, foxes had covered the entire mainland area of Australia except the tropical north. The spread of foxes throughout Australia was closely linked to the spread of rabbits. Fox population densities range in numbers from 0.2 adults per square kilometre up to 12 adults per square kilometre in some urban populations. Females breed only once per year, with an average litter size of four up to a maximum of about ten. Most cubs are born in August and September. Foxes become mature from about 10 months of age. Although social groups of foxes are thought to exist, most males are thought to have one mate. Foxes tend to live as pairs or, in areas where food is abundant, in small family groups typically consisting of a dominant adult pair and some subordinate vixens usually related to the dominant pair. Fox groups have well-defined home ranges with stable borders. The size of the home range depends on the availability of food and varies from 30 hectares in urban areas to 1600 hectares in open areas. The fox is an opportunistic predator and scavenger. The fox has been recognised as a serious threat to Australian native fauna, with foxes identified as a factor limiting the success of seven out of ten mainland reintroduction of native fauna. Recent evidence suggests that foxes may take from 10-30% of lambs in some areas, which is much higher than previously thought. Foxes are controlled by poisoning using 1080 baits, shooting, trapping and den fumigation. 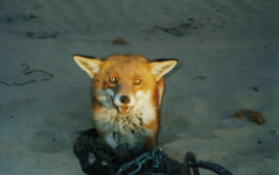 Which methods of control are best depends on the location of the foxes, and the risks posed by the control method utilised (which largely depends on the skill of the person undertaking the control). Trapping of foxes using foot-hold traps is a skill few master well enough to capture all foxes without causing some foxes to become trap-shy. Professional, skilled and trained personnel should be able to capture every fox and guarantee their results. A professional trapper within a professional company should be able to guarantee getting every fox – if not, they lack the skills we provide. So be careful of the contractor who offers a service at a price that does not offer a guarantee. In Western Australia, fox trapping using foot-hold traps requires the contractor to be licensed. Make sure that they know what they are doing! A license is no guarantee of effectiveness. Successful baiting programs on foxes requires using the best baits, in the right locations at the right time. To ensure the control of foxes in the long term, the baiting needs to be strategic. Careful selection of the right bait and limiting the number of baits used will ensure long-term, sustainable and effective control of foxes. Visit the Gnaraloo Station website (www.gnaraloo.com) for information on a successful conservation program, protecting turtle rookeries from fox predation. At Animal Pest Management Services, we have the necessary training, licences and experience to execute fox shooting, poisoning and trapping to an industry-leading standard. Based in Western Australia, South Australia and Victoria, we feral fox control services cater to clients in every state. Of 100 foxes trapped by us in 12 months within the Perth metropolitan area during 2015, 44% were female and the remaining 56% were male. Average sizes were females at 4.03kg and males averaged 5.09kg. The largest female was 6.0 kg and the heaviest male was 7.2kg. This compares to foxes trapped in the Pilbara where average sized females were 3.32kg and males averaged 4.04kg. At Pretty Pool Beach in Port Hedland, foxes predated on 88% of marine turtle nests during 2009. With the close proximity of houses, the use of poison baits was not feasible. Trapping by APMS removed all the foxes in 6 days, reducing the turtle predation level by foxes to zero. Ongoing programs have continued this success for the past 7 seasons. For further information or enquiries about fox control services, please contact the professionals at Animal Pest Management Services today.